Cross-reactivity to other subtypes not tested. Store at -20°C; Stable for 6-months from the date of shipment when kept at 4°C. Non-hazardous. No MSDS required. Small volumes of anti-Pol (SIV/mac239) antibody vial(s) may occasionally become entrapped in the seal of the product vial during shipment and storage. If necessary, briefly centrifuge the vial on a tabletop centrifuge to dislodge any liquid in the container`s cap. Certain products may require to ship with dry ice and additional dry ice fee may apply. 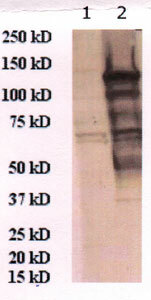 Western Blot: 1:200-1:1000. May be used for other applications.